Right there in the dictionary under “excruciatingly painful”. But it’s something a lot of us need to do. I knew if I was going to start eating healthier I was going to have to include more green veggies. Especially salads with dark leafy greens. So I knew that to do that, I needed to make sure the salads weren’t boring. I mean, who wants to eat the exact same salad everyday? So there absolutely needed to be a variety of salad dressings available. Because variety is the spice of life and all. And, of course, they needed to be Keto friendly. Loved by millions the world over. And rightly so! Because it’s for WAY more than just salads. Dipping, dunking, pouring, you name it, Ranch Dressing has played a part. 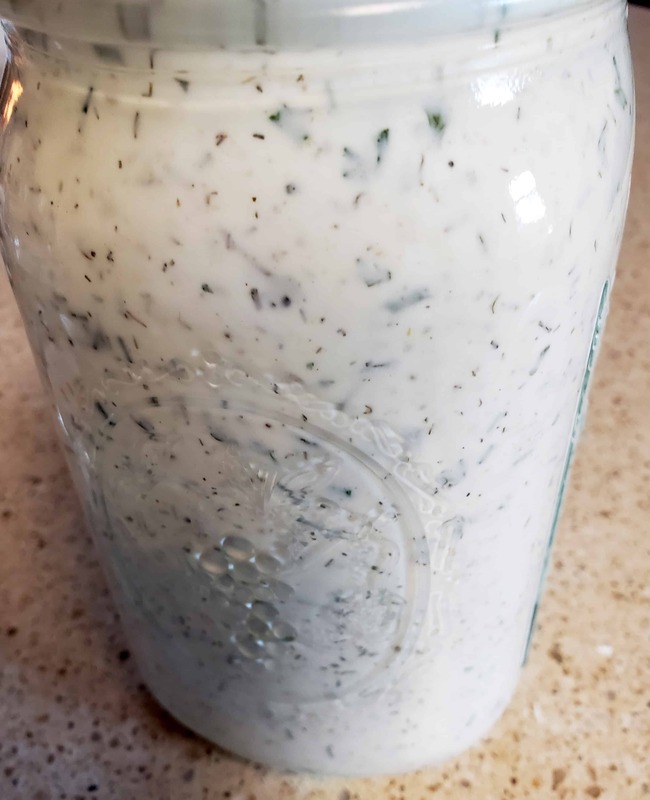 So my goal in life became to make the Perfect Keto-Friendly Ranch Dressing that was as good as the original. Only better, because it’s homemade and fresh and yuck-free. Testing and experimenting until I finally came up with this truly amazing concoction that any salad would be proud to wear! 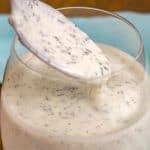 I give you: The Perfect Keto Friendly Ranch Dressing! And because I’m all about easy, I have a mix recipe to make up ahead of time too. And directions for using it to make dip. Let the Ranch making begin! **We’re going to make our own buttermilk. 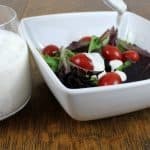 Put the white vinegar in a glass measuring cup and add the heavy cream until you have a cup. Let this sit for 5 to 10 minutes to thicken. I like to make my Ranch Dressing in a quart sized canning jar. That way I can just put the lid on and shake it up. Put the sour cream, lemon juice, and buttermilk in the jar (or bowl) and shake well (or whisk well) until it’s all smooth. Mix all those wonderful herbs and the salt and pepper in a small bowl. That helps the powders to not be clumpy. Now pour the herbs into the buttermilk and give it another shake or whisk. And now you need to put that wonderful elixir into the fridge for at least an hour to let the flavors mingle and meld. It’s actually even better after chillin out for about 24 hours. This should keep in the fridge for about 10 days. It makes a little less than 2 cups, so it’s never around that long in this house. Because we use it for everything…like a dunking sauce for these Cheesy Chicken Patties. Or even for dunking the Keto Fat Head Pizza in. My daughter got me started with the whole pizza and ranch thing years ago. And of course, I actually put it on salads as well. So I told you I had a mix recipe as well. And I really do! Mix thoroughly and store in an airtight container. Shake or mix before use. To make dressing: add 2 Tbsp of the mix to 1 cup buttermilk (like we made for the recipe up top), 3/4 cup sour cream, and 1 tsp lemon juice and mix until smooth. To make dip: add 1 Tbsp of the mix to 1 cup of sour cream and stir until combined. And there you have it. 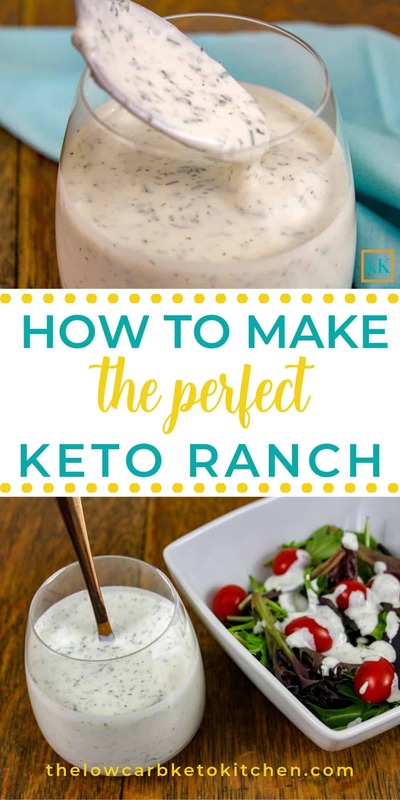 The Perfect Keto Ranch Dressing anyway you want it. This dry mix is also great for seasoning veggies or meats. 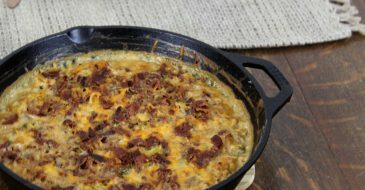 I use it all the time for my Chicken Bacon Ranch Casserole. Ranch dressing. You just can’t go wrong. Peace, Love, & Ranch Y’all! If You Liked It, Pin It For Later! If you're going Keto you need lots of low carb veggies. The best way to do that is in a salad. 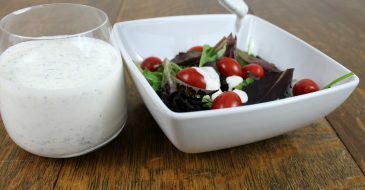 And here's the Perfect Keto Ranch Salad Dressing! **We're going to make our own buttermilk. Put the white vinegar in a glass measuring cup and add the heavy cream until you have a cup. Let this sit for 5 to 10 minutes to thicken. Put the sour cream, lemon juice, and buttermilk in the jar (or bowl) and shake well (or whisk well) until it's all smooth. Mix all the herbs, salt, and pepper in a small bowl. Pour the herbs into the buttermilk and give it another shake or whisk. Put that dressing into the fridge for at least an hour to let the flavors mingle and meld. It's actually even better after chillin out in the fridge for about 24 hours. This should keep in the fridge for about 10 days. 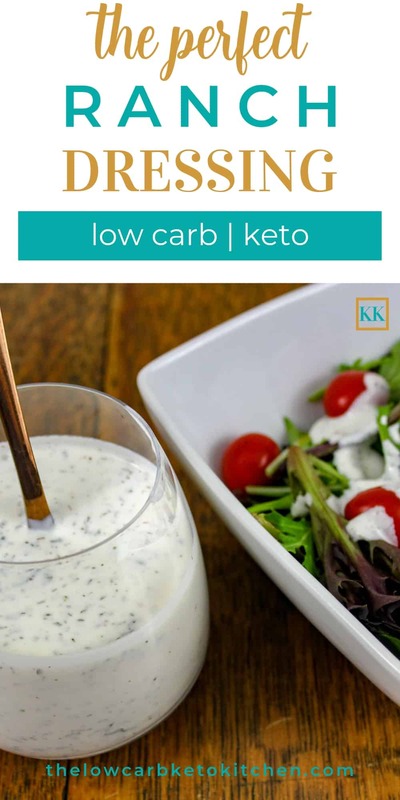 This Keto Ranch Dressing Mix Recipe is a great addition to your meal prep plan. You can make dressing, dip, or simply sprinkle it over meats or veggies to impart tons of flavor. Add 2 Tbsp of the mix to 1 cup buttermilk (like we made for the recipe up top), 3/4 cup sour cream, and 1 tsp lemon juice and mix until smooth. Add 1 Tbsp of the mix to 1 cup of sour cream and stir until combined. This seasoning mix is also good for sprinkling over meats or veggies for added flavor. A while ago I realized that it was way past time to do something about my growing waistline and nagging joint pains. After unsuccessful attempts to shed the extra pounds, I decided to get off the diet merry-go-round and do something healthy for my body. 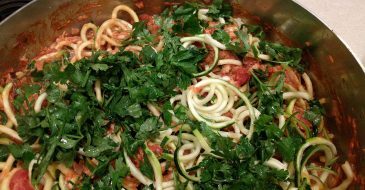 Need help with meal planning? We’ve got you covered! Some posts on this website contain affiliate links that allow me to earn a small fee. I will never link to something I do not own and use and love. Unless it happens to be on my wishlist. Overwhelmed? 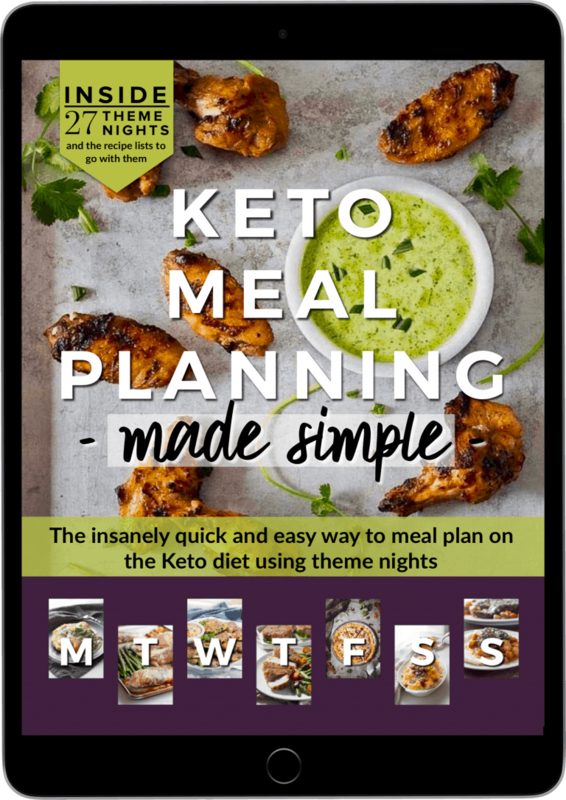 Get my free Ultimate Keto Food List printable. 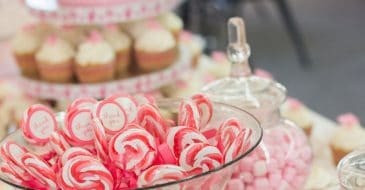 And get our monthly email with all the new recipes and updates from the blog!